These fishcakes are delicous comfort food, a good source of omega 3 and a great way to use up any leftover mashed potatoes and other vegetables from Sunday lunch. Place the salmon in a shallow pan, cover with the milk (top up with water if necessary), bring to a gentle boil and then simmer for 3-4 minutes, or until the fish turns opaque. Drain and leave until cool enough to handle, then remove the skin, flake and check for any bones. Meanwhile, place the potatoes in a large pan and cover with water. Bring to the boil and simmer for 12 minutes, or until just tender. Drain and return to the pan. Add the butter, and mash until smooth, then keep warm. Place the cabbage in another pan, cover with boiling water and simmer for 4 minutes until tender. Drain and add to the potatoes, along with the fish, half the chives and the lemon juice. Season, mix thoroughly and cool. Divide the mixture into 8 and shape into cakes about 2.5cm thick. Cover and chill for at least 30 minutes. When ready to cook, place the flour on a plate and dip the fishcakes in the flour until lightly but evenly coated. Heat the oil in a large frying pan. Cook the fishcakes (in batches if necessary) for 3-4 minutes each side or until crisp and golden. Drain on kitchen towel. Mix together the crème fraîche with the remaining chives and season. 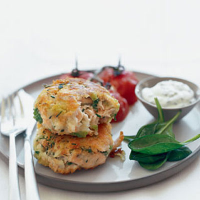 Serve the fishcakes with the chive sauce, roasted tomatoes and baby spinach leaves. You can also use smoked haddock in this recipe, instead of the salmon. If using up leftover mashed potatoes and other veg, skip point 2. Instead: mix together the mash and veg, the fish, half the chives, lemon juice and seasoning. Then continue with method step 3. These fishcakes are perfect with a light white, such as Gran López Airén 2007 La Mancha, Spain, which is great value and, at 11 per cent, has relatively low alcohol content.